Aim of the 2nd Symposium Machines, Mechanics and Mechatronics – Current Trends (SMMM 2019) is to bring together researchers, professionals and students from a broad range of disciplines related to Machines, Mechanics and Mechatronics to share their latest achievements and discuss the directions for the future researches in Machines, Mechanics and Mechatronics. 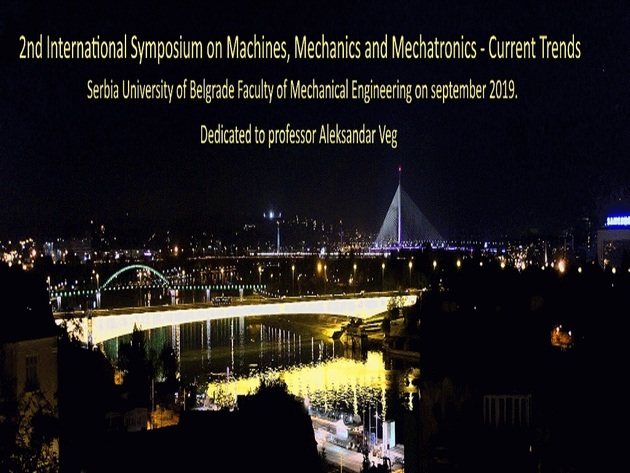 The first Symposium Machines, Mechanics and Mechatronics – Current Trends (SMMM 2014) was held in Belgrade in 2014. The 2nd Symposium is going to be held in Belgrade, Serbia, from 9th to 13th of september, 2019.
patronized by IFToMM (International Federation for the Promotion of Mechanism and Machine Science).